This installment of the Crawthorne’s Catalog of Creatures series clocks in at 5 pages – the front cover contains the header, creature artwork and the social media icons/homepage of misfit studios as well as some introductory text. The SRD takes up 1 1/3 pages and the editorial is in a sidebar – to get all the material you thus have to print out the cover with the icons and part of the SRD as well. Diminutive goat-headed constructs, these creatures want to eat ioun stones – once they have one, they can eat it as a standard action, gaining its benefits. They can sense ioun stones, can be repaired (and self-repair when ingesting the proper stone) and spit them at foes, shattering them on impact, inflicting bleeding wounds. Their spiked skin also nets them a defensive, retributive skin that deals damage to those that hit it unarmed or via natural weapons. They come with construction requirements. It is pretty cool to see that these guys gain size via abilities…but, alas, we get not statblocks for such advanced ion eaters and have to do the math ourselves. Editing and formatting are good on both a formal and rules-language level – though the flavor text has a typo, confusing “green” with “greed” and e.g. a plural glitch or two. Layout adheres to the 2-column full-color standard of the series and while I’m not big on the social icons and dispersal of non-gaming parts through the pdf, from an aesthetic point of view, there is not much to complain about. 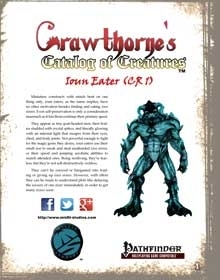 The pdf comes with the classic Crawthorne-artwork as well as the solid ioun eater artwork. The pdf comes with a second, more printer-friendly iteration, which is nice to see. The book has no bookmarks, but needs none at this length. I like the idea of these guys. In practice, though, Spike Y Jones’ critters would all starve (they’re constructs, so they wouldn’t die) and still go extinct faster than you can say: “Natural selection would screw these guys over.” Why? Look at the rules for diminutive creatures. Think of maximum heights when jumping. Guess what? These guys can’t jump very high if you remember that and use it still. Otherwise, they can jump like fleas. They also can’t climb. And no, the flavor text notwithstanding, they cannot fly. Even if no predators kill them, they just, RAW, have a VERY hard time getting anywhere near their food-source, which is wont to orbiting the heads of the titans called humanoids. This renders them a nuisance at best and a badly designed critter at worst that is hampered by one of the rougher sections of how small sizes and moving into hostile squares works. In short, even if your reading of the rules ignores the convention of maximum sizes for high jumps, they still will get whacked. Thankfully, I don’t have to elaborate on this particular clusterf*** of rules regarding AoOs, Acrobatics, etc. – and simply point out the fact that, no matter how you interpret the whole complex, the poor Ioun Eater still can’t reach his nom. A good idea, flawed in execution, I can’t go higher than 2 stars on this one. You can get these critters here on OBS!